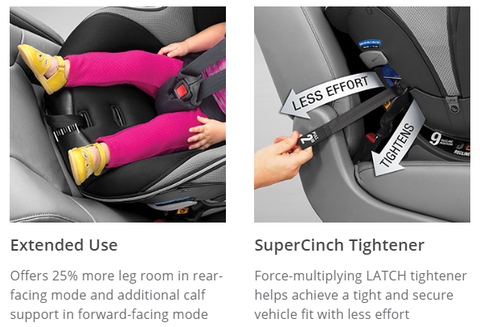 The NextFit Zip® Max offers 25% more legroom* in rear-facing mode, leaving room to grow all the way up to 50 pounds before transitioning forward. 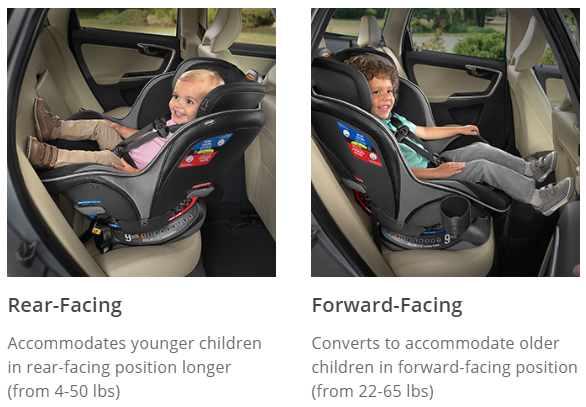 Extended calf support in forward-facing mode offers first-class comfort for older children. 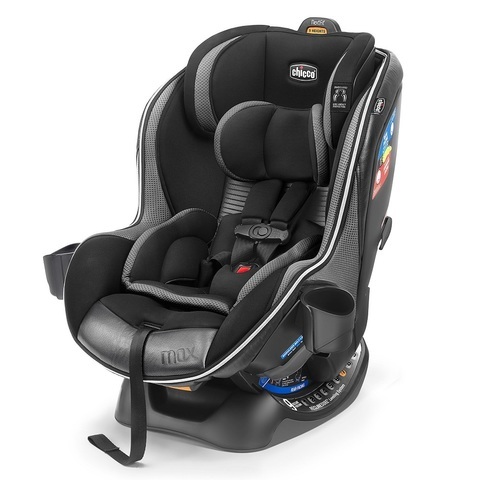 A full-body newborn positioner, 9-position headrest, and padded, no-rethread harness accommodate growth throughout both modes. The NextFit Zip® Max is designed to deliver the confidence of a secure install with remarkably simple leveling and tightening. A SuperCinch® force-multiplying tightener and LockSure® belt-locking system make it easy to achieve a tight fit with LATCH or with the vehicle seat belt. DuoGuard® provides two layers of side-impact protection with a deep rigid shell and EPS energy-absorbing foam. The seat shell is also reinforced with a steel frame. 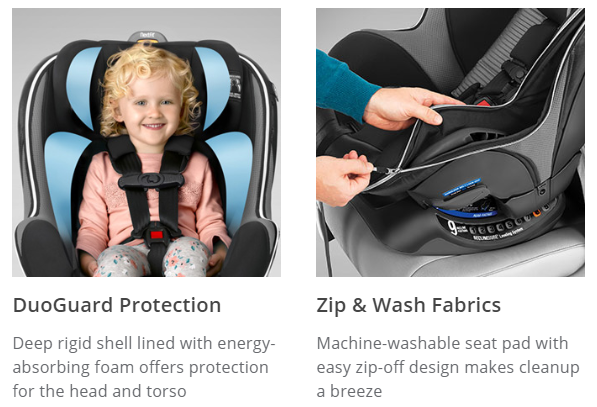 The seat transitions smoothly from vehicle to vehicle, and between modes, thanks to premium LATCH connectors with click-on attachment and push-button release, plus a built-in slide path to re-position the LATCH strap for forward-facing mode. 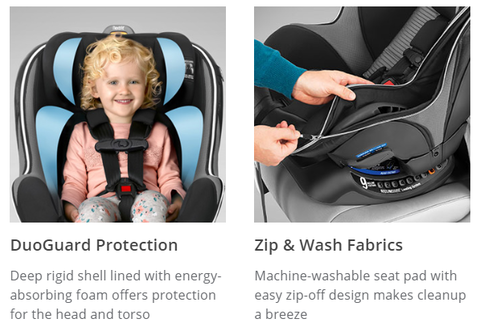 For added comfort and convenience, the NextFit Zip® Max features a machine-washable, zip-off seat pad and a breathable 3D AirMesh backrest. For use from 4-50 lbs in rear-facing mode, from 22-65 lbs in forward-facing mode, and up to 49"
Fabrics may be spot cleaned, hand-washed, or machine-washed in cold water on delicate cycle using mild detergent. Do not use bleach. Hang to dry. For plastics, sponge clean using warm water and mild soap. Towel dry. 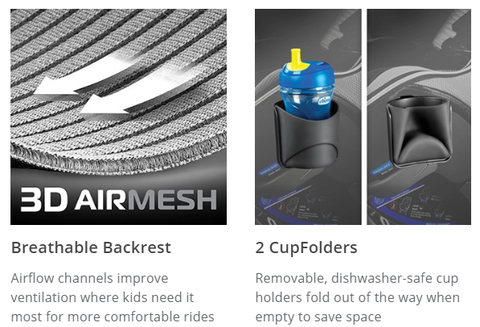 Cup holders are dishwasher-safe on top rack only. 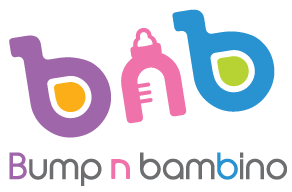 For complete care and maintenance instructions, refer to the label on the product and to the product’s instruction manual. Assembled Product Dimensions: W 19" x D 23.75" x H 29.2"